Crunchy PostgreSQL for PCF brings the tools and expertise software engineers need to make their open source database environments successful and manageable. Bringing on demand and fully automated management of Crunchy Certified PostgreSQL to Pivotal Cloud Foundry allows developers to easily deploy a production ready PostgreSQL cluster within Pivotal Cloud Foundry environment. Full, incremental, & differential backups reduces data loss in disaster recovery situations. Load balanced PostgreSQL primary / master database with asynchronous replication to multiple replica databases delivers reliable high availability and uptime. Secure applications at scale on Pivotal Cloud Foundry, including security data visibility, protection, and scalability. Crunchy Certified PostgreSQL is a 100% open source distribution of PostgreSQL - a powerful, open source, object-relational database system, packaged and commercially supported by Crunchy Data. The distribution includes the latest version of the open source PostgreSQL database as well as additional open source extensions that allow organizations to deploy and manage PostgreSQL in today’s complex IT infrastructure environments. Crunchy PostgreSQL for PCF provides PostgreSQL infrastructure necessary to support enterprise requirements. To achieve the performance and efficiencies available in a Pivotal Cloud Foundry environment, production PostgreSQL deployments require more than the database – advanced capabilities for high availability, backup/restore, disaster recovery and monitoring are also required. 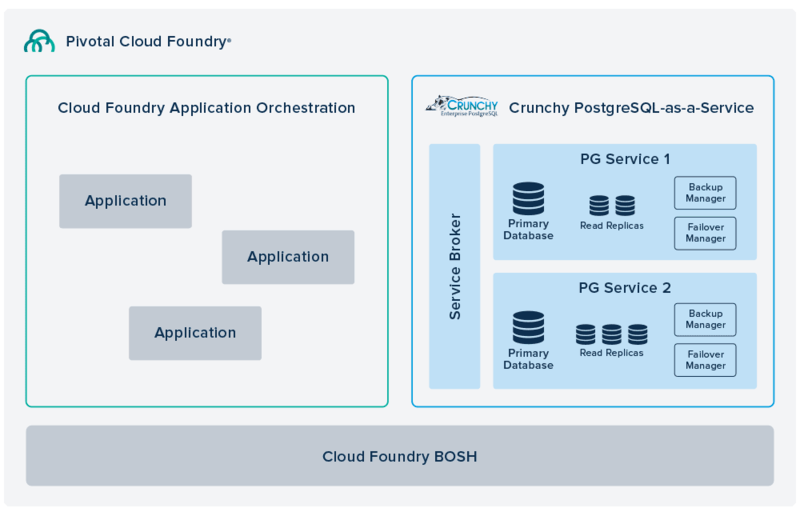 Crunchy PostgreSQL for PCF brings BOSH deployed Crunchy Certified PostgreSQL to Cloud Foundry, allowing developers to easily deploy a production ready PostgreSQL cluster within Pivotal Cloud Foundry (PCF) environment through a PCF Service Tile. The Crunchy PostgreSQL for PCF on-demand service broker enables developers to deploy production ready on-demand PostgreSQL clusters, entirely managed by BOSH.